January’s over already and this is my first monthly blog! Welcome everyone, this is my first attempt at a blog so hope you enjoy reading it. The new year started with launching this website and blog and before you know it January is over in a flash. Another month of winter behind us, and one less month to work in the dark through the cold, the wet, the frost and the mist. 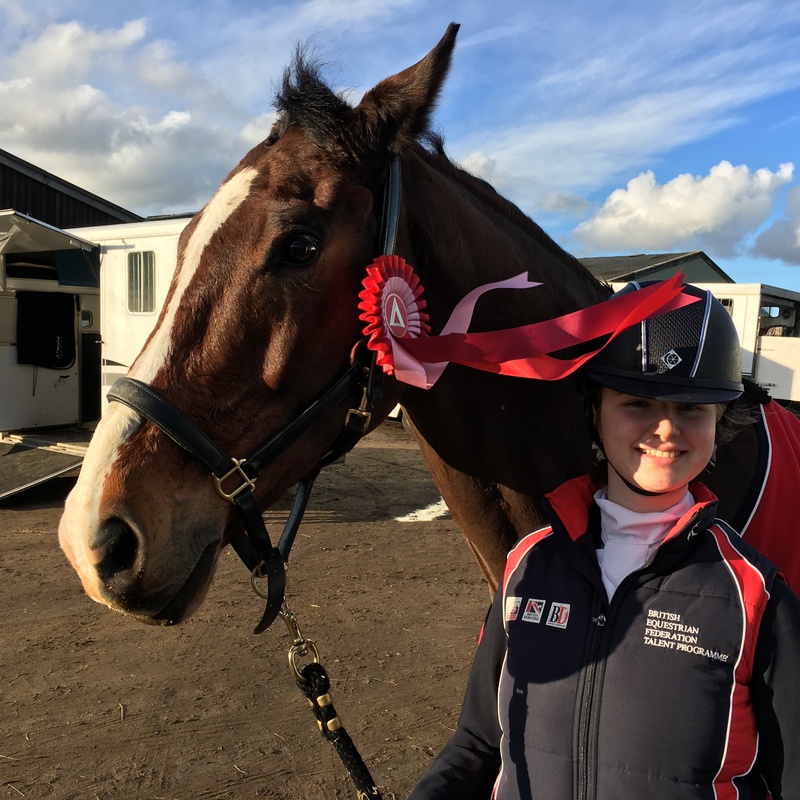 But it was a good month with frequent and regular schooling and coaching sessions with Sacha, some lovely hacks with the girls from the yard and increasingly hard gym sessions with Iain every week as he pushes me further every time …. but best of all, the opportunity to get out and compete with Aslan for the first time this year. It has been a surprisingly busy for Aslan and me (in between me trying to study for my mock exams). We focussed our training on balancing priorities of developing core skills, getting ready for competitions under the old test and learning the new 2017 FEI tests, which add in collected trot, rein back, turn on the haunches, 10m canter circles and counter and medium canter too, so its going to be a busy year with some exciting changes – I can’t wait !! At the start of the month I received formal confirmation of my invitation to compete at the Winter Nationals at which I will ride for the first time in March. It was a bit frustrating not to have my invite at the same time as everyone else when I saw them on Facebook and I was beginning to think I had added up my scores incorrectly, so I was very happy and proud to get it though at last! I am really looking forward to it and it will be biggest and most important event I will have competed in to date. Mounting Aslan with Sacha at Hartpury for our first competition outing of 2017. I have also been fortunate to get my new saddle settled in this month. It is a 1/2 inch bigger in the seat and has longer flaps to better fit my legs, that are quite long from hip to knee which you can see in the picture of me mounting. The new saddle gives me more security in the seat and has helped me improve my posture. The saddle was measured up, designed and fitted by Kay Humphries from Norton and Newby in Oxfordshire who has been helping me and visiting the yard through last year as Aslan has been developing. Kay has such amazing knowledge and experience and puts such emphasis on getting it just right for me and always putting Aslan first. I can’t thank her enough and I’m very happy with the result, as is Aslan. Hartpury learning included finding out that Aslan does not like ribbons flapping in the breeze. It was a busy weekend as on the 29th I went to the BD Para Coaching Symposium held at Moulton College in Northampton, this time with mum and Sacha and Emma. This was a very informative day and very useful heading into the new competition season. We had an informed view on how the new tests look and some judges’ input on what they are looking for, which will help me in the new competition season. I was able to watch Izzy Palmer ride with her coach Angela Wise, who is also one of the coaches on the Excel Programme, and her mentor Paralympian Sophie Wells MBE who Angela also coaches. It was great to see Izzy ride as she is the same grade as me (old III and new IV for 2017). We also had a real treat from Sophie who demonstrated her silver winning freestyle in the Rio Paralympics games on Reece. And finally, back to the beginning, launching this new website and blog at the start of the month was exciting for me as I have never had a website before. Thank you everyone for all the positive messages you have sent me and thank you to those who voted on which photos I should use, it made it a lot easier! One last thank you is due to all those who have joined my journey by following @ilsedressage on Facebook this month, and have also started following me on Twitter and Instagram too. When I’m training on dark damp and cold winter evening it really helps to know that people care enough to stay in touch with my development, and it genuinely inspires me to work hard. So thank you. I hope you all enjoy the journey as much as me, and keep on letting me know what you think! Coming up, I am off on a school trip to Berlin (in preparation for my upcoming mock exams) and I am riding also in a Central Region test event for the first time in February, so another new experience for me – I really am loving every minute of this journey with Aslan. Thank you for reading this and thanks for your support it really helps and means the world to me. If you see us out and about do come over to say hello.